Scouting in Yorkshire and the Humber is largely represented by the Scout Association of the United Kingdom and some Groups of traditional Scouting including the Baden-Powell Scouts' Association. The Scout Association in Yorkshire and the Humber is part of the Scout Association North East Region, as is the Scout Association in Scouting in North East England. The Scout Association North East Region is the only one that covers two official regions of England. There are also three student Scouting associations at various universities in the region, each of which is affiliated to the Student Scout and Guide Organisation (SSAGO). These are Students of Hull Association of Guides and Scouts at the University of Hull; Leeds University Union Scouts And Guides covering the University of Leeds, Leeds Metropolitan University and Leeds College of Music; and Sheffield Students in Guides and Scouts covering the University of Sheffield and Sheffield Hallam University. The Scout Association in Yorkshire and the Humber is administered through five Scout Counties, Central Yorkshire Scout County, Humberside Scout County, North Yorkshire Scout County, South Yorkshire Scout County and West Yorkshire Scout County. Central Yorkshire, provides Scouting opportunities for young people and adults in the metropolitan boroughs of Leeds and Wakefield and the surrounding area. Leeds Templars. This district covers the eastern area of Leeds. The County organises international expeditions, enabling a number of Explorer Scouts and Scout Network members to undertake adventurous activities in other countries. The next County Expedition is in 2008, where they will be visiting Kenya. The Expedition will consist of mountaineering on Mount Kenya, trekking by camel back, and a community project. There will also be a safari through a game reserve. 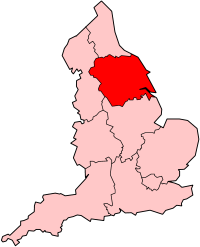 Scouting in Humberside covers the former non-metropolitan county of Humberside. The headquarters of Humberside Scouts is at Raywell Park Activity Centre. North Yorkshire Scout County covers the county of North Yorkshire. North Yorkshire Scouts clebrated the Centenary of scouting in 2007 by joining the Bilton Conservation Group to plant 2000 trees donated by the Woodland Trust. There are Scout Network units in Easingwold, Harrogate and Nidderdale (LYNX), Ingleborough, Leven, Northallerton, Richmondshire, Ripon, Ryedale, Scarborough, Selby, South Craven, Vale of Mowbray, Whitby and York. Scouting in South Yorkshire includes Sheffield, Barnsley, Rotherham and Doncaster. The Doncaster Danum District has a Scout Band. SGS Outdoors is a combined Scout and Guide Shop in Sheffield with a full e-commerce website. There is also a Scout Shop in Doncaster with online access. West Yorkshire covers the metropolitan districts of Bradford, Kirklees, and Calderdale. The Scout county of West Yorkshire does not cover the whole of the West Yorkshire metropolitan county. Because the West Yorkshire area is densely populated the boroughs of Leeds and Wakefield have their own Scout County called Central Yorkshire. The Scout county's office is located within the Jubilee Centre at the Bradley Wood Campsite on the outskirts of Brighouse. West Yorkshire Scouts celebrated a successful centenary year of 2007 with an awards evening in early 2008. The Aldwark Water Activity Centre is owned and maintained by Central Yorkshire Scout Association County. The centre is located on the River Ure, 8 miles upstream from the city of Leeds. The centre has one large camping field, as well as a converted mill which consists of a number of dormitories. The centre has kayaks and boats for sailing, and runs training courses to gain qualifications in these activities. The Bramhope Scout Campsite is situated just outside of the village of Bramhope, approximately 8 miles north-north-west of Leeds. The site covers thirteen and a half acres of woodland and fields, offering various camping pitches for any sized camp up to a District camp. As well as the camping pitches, there are a number of buildings on the site offering accommodation and indoor training facilities. The site offers archery, air rifles, pedal karting, climbing, abseiling, and pioneering, amongst other activities. There are also facilities located near to the site which enable sailing, kayaking and swimming. Hesley Wood Scout Activity Centre, Chapeltown, Sheffield. Silverwood Campsite, Great Falls, Silkstone, Barnsley. Squirrel Wood Campsite, Burghwallis, Doncaster. Hesley Wood is used for Wood Badge and other Adult Leader Training. This page was last edited on 6 May 2012, at 14:30.